The 2010 Easter Date applies to the western calendar (Catholic and Protestant Churches), and also to the The Eastern Orthodox church. This is an unusual event since the two branches of Christianity have different methods for calculating the correct date for Easter. There are only a few years each century when the Easter dates match like this so Easter 2010 is seen as extra special. The Ethiopian Easter is more Jewish than christian in its practices. The lamp is scrified for over 60% of the house hold in Ethiopia this is done with the same ritual to that of the ancient Hebrews. However in the rest of the Christian world the sacrificed has ceased since Jesus gave his life as the Lamb of the Lord on the Cross. The first four of the seven feasts occur during the springtime (Passover, Unleavened Bread, First Fruits, and Weeks) . The final three holidays (Trumpets, The Day of Atonement, and Tabernacles) occur during the fall, all within a short fifteen-day period. 9 The Lord said to Moses, 10 “Speak to the Israelites and say to them: ‘When you enter the land I am going to give you and you reap its harvest, bring to the priest a sheaf of the first grain you harvest. 11 He is to wave the sheaf before the Lord so it will be accepted on your behalf; the priest is to wave it on the day after the Sabbath. 12 On the day you wave the sheaf, you must sacrifice as a burnt offering to the Lord a lamb a year old without defect, 13 together with its grain offering of two-tenths of an ephaha of fine flour mixed with oil—an offering made to the Lord by fire, a pleasing aroma—and its drink offering of a quarter of a hinb of wine. 14 You must not eat any bread, or roasted or new grain, until the very day you bring this offering to your God. This is to be a lasting ordinance for the generations to come, wherever you live. Why does the Easter date move every year? in the year 325AD, the Roman Emperor Constantine got the early Christian leaders together at Nicea to fix matters of doctrine and dates of important Christian events such as Easter. They chose the first Sunday after the full moon following the vernal equinox; (as opposed to Christmas day which they fixed as 25th December). A very common theme present in many ancient Pagan religions described the life of a man-god — a savior of humanity — his execution, his visit to the underworld, his resurrection after two or three days, and his ascension to heaven. The life of Yeshua of Nazareth (a.k.a. Jesus Christ) as recorded in the Gospels includes the Christian version of this theme. Good Friday is observed in remembrance of Jesus’ execution by the occupying Roman army, and his burial in a cave-tomb. Easter Sunday is the date when a group of his female followers first noticed the empty tomb, and concluded that he had either been resurrected, or his body had been stolen. The timing of the Christian celebration of Easter is linked to the Jewish celebration of the Passover. Passover and the Feast of Unleavened Bread were observed by the ancient Israelites early in each new year. (The Jewish people followed the Persian/Babylonian calendar and started each year with the Spring Equinox circa MAR-21). “Equinox” means “equal night;” on that date of the year, the night and day are approximately equal. The name “Passover” was derived from the actions of the angel of death as described in the book of Exodus. The angel “passed over” the homes of the Jews which were marked with the blood obtained from a ritual animal sacrifice. The same angel exterminated the first born(s) of every family whose doorway was not so marked – one of the greatest acts of mass-murder mentioned in the Bible. Victimized were first-born sons as well as the first-born of domesticated animals. The Synoptic gospels (Mark, Matthew and Luke) state that Jesus’ last supper was a Seder – a Passover celebration at the start of 15th Nisan, just after sundown. (Jewish days begin at sundown and continue until the next sundown). Jesus was executed later that day and died about 3 PM. The gospel of John states that the last supper at the beginning of 14th Nisan. Jesus is recorded as having died on the afternoon of 14th Nisan. Most theologians reject John’s timing. They assume that John chose a false date for symbolic reasons. 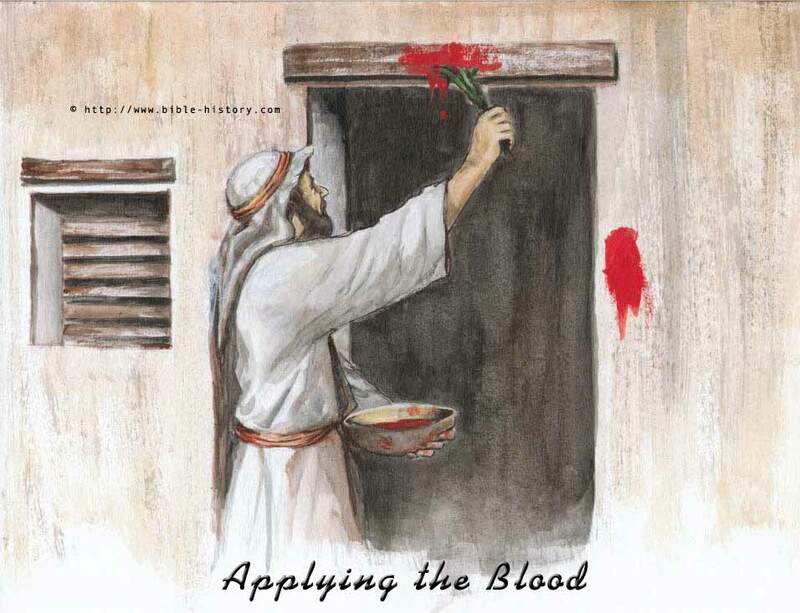 He made Jesus’ execution synchronize with the sacrifice of the Pascal lamb in the Temple at Jerusalem. If Jesus was murdered on a Friday, then Passover would have fallen on a Thursday. This happened both in the years 30 and 33 CE. Some liberal Christians have suggested that the actual date of Jesus’ execution is unknown, that it might have happened at any time during the year, and that the early Christian church arbitrarily selected Passover as the time. This allowed them to link the most important religious days in Judaism and Christianity. It also allowed the human sacrifice of Jesus (“Christ our paschal lamb” in 1 Corinthians 5:7) to be linked to the sacrifice of the Pascal lamb in the Jewish Temple. Other theologians have suggested that Yeshua of Nazareth never existed, or that he lived centuries earlier, or that he was never crucified. Over one billion Muslims in the world believe that he was not executed by the Roman Army. Passover, otherwise known as the spring festival, celebrates the exodus of the Jewish people from captivity and slavery by the Egyptians. 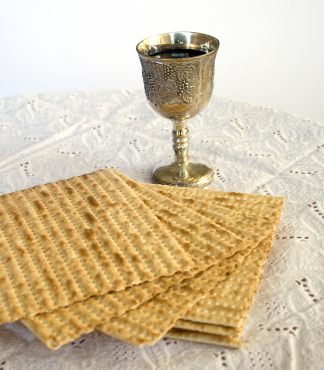 According to Jewish law, Passover begins on 15 Nisan, lasting for seven days in Israel and eight for Jews living in the Diaspora.The literal translation for Passover or Pesach in Hebrew derives from when God when slewing the first-born (Exodus 12: 23) as the last of the eight curses imposed upon the Egyptians to passed over the houses of the children of Israel. In modern times, within the Diaspora, the festival came to be known as Passover, although many Jews refer to the festival as the Hag Ha-Matzot, meaning ‘the Festival of Unleavened Bread’. This is what typifies Passover for most Jews, the fact that eating leavened bread (hametz) is forbidden, and eating only unleavened bread (matzah) is allowed during the entire duration of the festival. (Exodus 23: 15; Leviticus 23: 6; Deuteronomy 16: 16). As part of Halakhich law, on the night before Passover begins (14 Nisan), every Jewish home must be thoroughly searched and any hametz removed from the house. Many observant Jews observe the tradition of carrying out a last minute token search for hametz using a candle and feather to brush away any last crumbs that may have been overlooked. A prayer is then offered declaring any hametz that may have been overlooked be rendered void. In modern Israel, it has become common practice for a non-Jewish person to make a ritual purchase of all hametz stored in the country’s warehouses, as Israel imports all her wheat. At the end of the festival, the hametz is sold back to the country, at a token profit. Preparing of matzah must be carried out under the rules of kashrut and under the strictest of supervision. In Israel, there are many specialist bakeries that produce only Matzot, as they keep all year round. Special care is required to be taken, whilst the dough is being kneaded and whilst it is being baked. The supervisory ritual, known as shemirah is to prevent the dough from fermenting so that it doesn’t rise. As is the case with many other aspects of Judaism, there are arguments as to what stage the shemirah should begin. The fact is that many find eating matzah hard to bear and desist from eating bread altogether for the duration of Passover, apart from a single piece that is obliged to be eaten during the Li’l Haseder (Seder night) ritual which takes place on the first night of Passover. Jewish people in the Diaspora hold two Seders, on the first and second nights of Passover. Passover is one of the most enjoyable, family orientated festivals in the Jewish religion and celebrating Seder together with families and friends is the highlight of their religious year. Seder in Hebrew means order, and when used to describe the service and festive meal held on the first (and second) nights of Passover, maintaining the order or sequence of events holds great significance. A special prayer book known as the Haggadah acts as a program for the evening, laying out in considerable detail the order of the event as they are supposed to happen. A literal translation for the word Haggadah is “telling” ‘, and indeed, the Haggadah tells the story of the Jews coming out of Egypt and their need to pass on the story of their Exodus into the desert and their subsequent freedom for generations to come. Interestingly, despite the fact that the Talmud mentions the story of the Exodus, no formal Haggadah was printed for thousands of years. Today the Haggadah exists in around 2,000 formats containing not only specific instructions on how the Seder table be laid out as well as how the service be conducted. Matzot: Unleavened bread, three in number, representing that when the Jews went out of Egypt, they had no time to wait for their bread dough to rise. The Matzot are placed on a special plate and covered with a specially embroidered Matzah cover. Maror: These are bitter herbs, representing the bitter and tough lives of the Hebrew slaves. Charoset: This is a paste made from apples, almonds and wine, to remind Jews of the mortar used to build the Pyramids with a sweet taste to represent the sweetness of freedom. Salt Water: This represents the tears of the oppressed Hebrews. Parsley: To dip in the salt water. A Roasted Bone: This is to represent the Paschal lamb that was slaughtered during the days of the Temple when Passover was first celebrated. Once the father of the Seder has inspected the table and made sure that all is in order, then the Seder can begin. First of all Kiddush (benediction) over the first cup of wine is taken. Anyone at the table, who has passed the age of bar mitzvah, is allowed to drink wine at the Seder table. The next stage is to break the middle slice of Matzah into two parts, with one half being set aside as the afikoman (dessert). 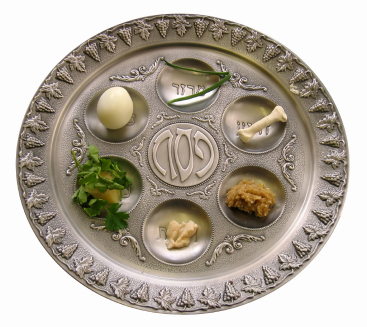 The parsley on the Seder plate is then dipped into the bowl of salt water and passed around by the “Ab Haseder” (father of the Seder) to be eaten. The next stage is when the youngest person at the table (who has been Bar mitzvah) is allowed to ask the “Four Questions” Usually this segment of the service is treated very lightly, with the person who has been given the task of asking these questions suffering from stage fright and being egged on by the rest of the family and friends around the table. The questions basically ask” why is tonight different from all other nights” and pertain to the sudden change in circumstances of Jewish people during their Exodus from Egypt. The four questions are answered by the guests in a light hearted and frivolous manner but in strict accordance with what is written in the Haggadah.